Few things are more exciting than projects or ideas that connect the dots between different compelling issues. The intersection of technology and social change is a crosspoint that encapsulates the challenge and opportunity of the present day. We have been engaging at this junction with the creation of a map that shows organizations across British Columbia (plus Canada’s North) whose work supports the United Nations Sustainable Development Goals. The mounting interest and momentum for this project has been such that we are currently expanding the map across Canada and seeding the idea for the implementation of this technological tool internationally. Our global society is faced with complex and interconnected problems that require just and effective solutions. In 2015, the United Nations, guided by people in countries around the world, sought to describe a framework for achieving sustainable development through 17 “Global Goals” (Sustainable Development Goals, or SDGs) with measurable targets to reach by the year 2030. These goals span social and environmental categories – from gender equality to climate change action, to protecting nature, to building inclusive and prosperous communities and ending poverty – the reach is wide. Given the size and complexity of this global agenda, mapping technology has a role to play in supporting global efforts for measuring progress and encouraging action on these goals. It can be overwhelming to see the SDGs all together and think of the scale of the task, but we have found one thing in particular that brings heart: there is already so much work being done by civil society, both locally and globally, to see these goals achieved. From university clubs and small grassroots initiatives to the work of national networks and international organizations, these initiatives collectively represent millions of people contributing to the big picture of sustainable development in their own communities and around the world. People are stepping up to protect the environment, advocate for rights, provide human services, educate children, and so much more – and this work is often overlooked or underestimated. We considered how we could make these efforts more visible, which would in turn build more collaboration and support for more action on the SDGs. Thus, the Movement Map was born. The Movement Map was created around the idea that visualizing the work already being done by civil society on the Sustainable Development Goals would help connect local action to the global agenda. It would also celebrate and promote this work, with the goal of accurately capturing the current scale of civil society engagement with and contribution to the SDGs while building momentum for more work to become visible and supported. 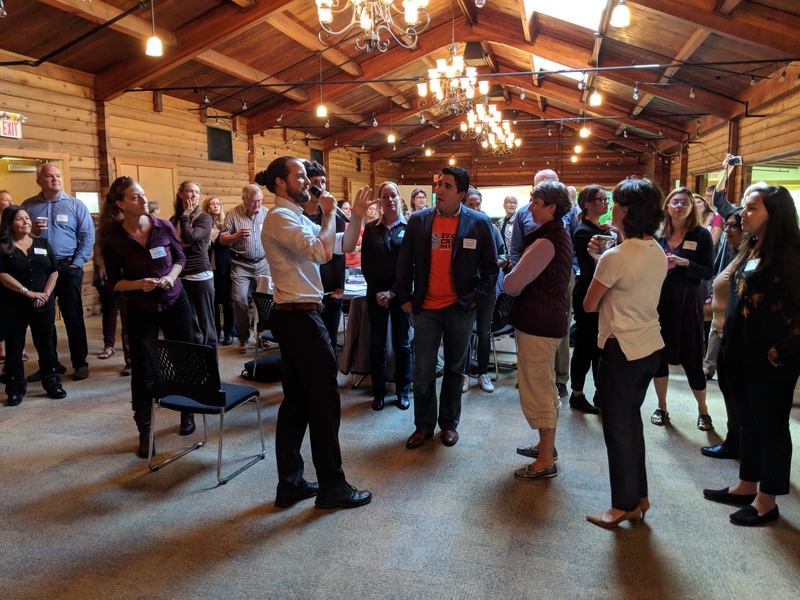 The idea for the Movement Map came out of a 29-community public engagement tour which intended to find out how British Columbian Civil Society Organizations (CSOs) were already advancing the SDGs. This was done by drawing out people’s knowledge of local organizations and initiatives that could be seen as already working on any of the goals. Overwhelmingly there were piles of suggestions, and participants believed that it would be helpful for this information to exist somewhere where it could be used for public good. It was at a meeting in Victoria when one participant exclaimed that “it’s like an invisible mosaic” of organizations whose efforts remain largely invisible to the public, politicians and even many of the organizations themselves. The goal of the Movement Map is to make the invisible, visible. Information and mapping technology has a growing role in our rapidly changing world. Maps perform many functions at once and yet remain accessible to understand; they can visualize complex ideas, highlight potential collaborations, connect to open source information, and be shared easily on online platforms as well as in print. The ability to build maps and work with large amounts of information is a skill that has great usefulness in any society – and so supporting mapping projects such as the movement map has innumerable benefits. We are pleased to be employing young people to work on the Movement Map who will be able to take their mapping skills and SDG knowledge with them into the world. We envision future functions of the Movement Map with other technological integration, such as connecting the ability to raise funds and donate using blockchain, connecting members of the public or youth looking to volunteer with organizations needing volunteers, connecting groups working on similar development related issues, or simply providing more information on SDG related activities such as news stories related to initiatives on the map. The idea that a map like this could go global, or be replicated, has already taken form with some initial connections made at the United Nations – BCCIC has co-hosted “Global Invisible Mosaic” events twice at the High-Level Political Forum in New York, and SDG enthusiasts from other countries have been asking when the map will be coming to their part of the world. Just as the amount and forms of solutions for global sustainable development are limitless, so is the potential of mapping technology to support those solutions. We are working steadily to make connections, highlight solutions, and reveal this invisible mosaic, one piece at a time. BCCIC has entered the SDG Action Awards with our Movement Map project. You can check out our profile here and we hope to count on your support when voting begins. We hope this project can inspire organizations around the world to connect with other organizations who are working on the SDGs in their community!